The New York Observer picks Trump. Surprised? 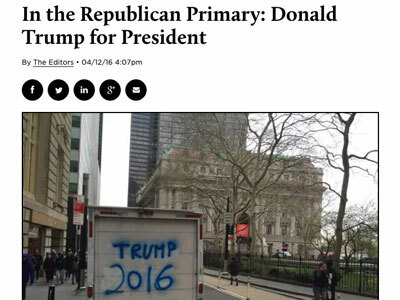 The image the New York Observer chooses to accompany its endorsement of Donald Trump for the Republican nomination shows a scene from lower Manhattan, white truck as the focal point. There’s a simple message spray-painted in blue on the back: Trump 2016. Subtext: Populism! What follows is not a clearly articulated list of Trump’s proposed policies, because he’s never really had much in the way of specifics other than, you know, wall! But that’s OK, because Trump is selling something bigger than “14-point proposals or an SAT-like cramming of policy details.” He’s selling optimism. Also, “faith and leadership. Faith that Americans have the will to craft a brighter future, and the leadership to make it happen.” But without those studious details.